Resin Grill Heritage Pattern Discounts Apply ! 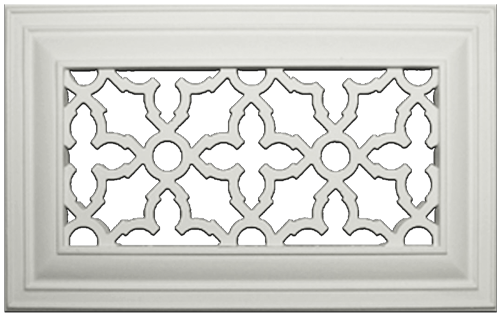 Return air vent covers with the Heritage Pattern will give your space an updated look. These decorative wall grills will not only look fantastic, they will stand the test of time. 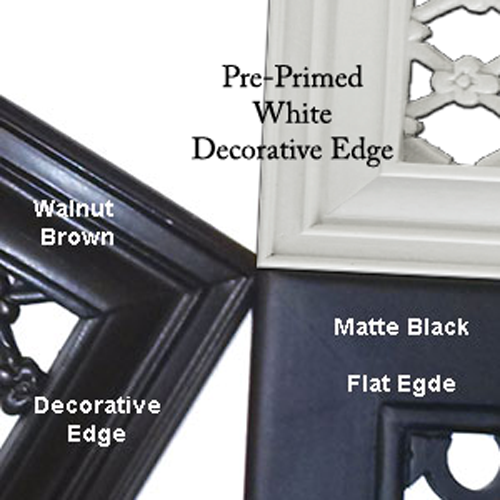 With two border options and three color options, you can easily customize your decorative wall grills for the perfect look. Furthermore, the return air vent covers are hand cast in the USA, ensuring the highest quality product. Our decorative wall grills are cast using a high density, low VOC polymer. This means that the return air vent covers are environmentally friendly, as well as durable. The density of these return air vent covers makes them resistant to bacteria, corrosion, moisture, insects, cracks, and more. Looking for specific screw hole placement? You can simply order your decorative wall grills with no screw holes and drill your own. When drilling holes into the return air vent covers the resin will react similar to wood. Want to control the amount of air allowed to pass through the decorative wall grills? Simply order a damper at the same time and you will receive a functional register allowing you to control the air flow. These grills are special order and cannot be returned or canceled. Return air vent cover sizes are listed for the duct hole size they are meant to cover. For instance a 12 x 12 size duct hole would need a 12 x 12 return air vent. The total overall dimensions will vary based on size selected and will be approximately 1" to 3" larger than the listed hole size. The lead time on this item is 2 to 4 weeks to be manufactured.. Check out all the designs these grills are offered in. Replace your rusty, boring grills with these decorative wall grills that will last for years to come.